Deciding which surge protector to purchase for your RV isn’t an easy task. While there are many different models and brands available on the market, when it comes to something as important as your power while traveling, you want to know everything there is to know about your purchase. How reliable is it? Will it take up a lot of the already precious space in your RV? What are the maximum loads? Is there a way to secure it and protect it from theft? You may also be wondering if you even really need an RV surge protector and what they offer your camper in the way of protection. The short answer is: yes, you need one. We’ll get into the whys of having a surge protector, what type to choose and how they protect your RV after the review. So don’t skip the part after the products, there’s a lot to learn there too. For now, let’s just review the actual surge protectors. They’re rated below by AMP, adaptability, ease of installation, durability and special features. Any additional features or included accessories will be noted, as well as any reported issues with the protectors during their use. In this article, we’re going to give an in-depth review of four of the most popular 50 AMP surge protectors that are available on the market today. We’ve chosen the best,in our opinion, so read on to learn more about the unique features each of these surge protectors provides. Easy to read lighted display. Locking bracket helps to prevent theft. Progressive-Industries-EMS-PT30C-Portable-Protector is a 50 AMP device that features a single ‘bone’ or connection rod to your hook-up. The display is illuminated with various keys to inform the user of the power status. The display includes lights for open ground, reverse polarity and pen neutral status, as well as power on, miswired indicator and a surge failure indicator. There are five surge protection modes: 1650 joules / 45,000A. Ratings: 50A / 120V/240V / 12,000W. The ideal operating temperatures for this surge protector are -40C to + 105C. Measuring 14 x 5 x 3.5 inches, the casing is weather-resistant and includes a locking bracket. When traveling in your RV, you know that you can experience a wide array of weather conditions. From the scorching desert to the frigid North, RVers love to explore no matter what Mother Nature throws at them. Fortunately, this surge protector is built well enough for all of it. It can withstand sub zero temperatures and sweltering conditions and keep on protecting your RV and all of the appliances inside. As I mentioned, yanking a surge protector out of the socket can be a challenge, even in the best of times. Having a rubber pull handle ensures that you not only don’t struggle, but that you don’t damage the unit in the process. Overall, when plugging into an untested outlet, you want to be able to see if anything is wrong immediately. With these indicator lights, it’s never been easier to figure out if you should drop anchor or find a new spot. If you’re searching for a decently priced surge protector that will protect your RV, provide everything you need in a portable unit and lock for security, this is likely your current best option. The inclusion of a 15 foot cord increases the use of this protector, and the unit is adaptable to smaller AMP connections. The durable housing with color-coded diagnostic lights makes it very easy to detect problems that you might experience at your campsite. 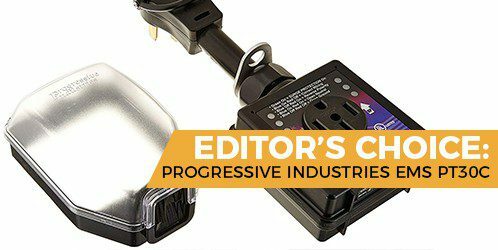 Overall, Progressive Industries makes some of the best surge protectors out there, and this one is certainly a top-quality model. I like that it’s simple and easy to use, and it comes with enough protection for most RVs. Compared to other protectors on the market, this one isn’t quite as smart as other ones I’ve seen, and it can be a bit cumbersome. 15 foot cord and display panel are included with the surge protector. This surge protector is heavy at 2.99 pounds. Single heavy-pull handle may make attaching and detaching problematic. Surge Guard 44270 Entry Level Portable Surge Protector - 50 Amp, available from Technology Research, provides a lot of features for an entry-level surge protector. Measuring 22.1 x 3.8 x 3.5 inches, the surge protector is equipped with grip handles for ease in connection and disconnecting. Offering 4200 joules of surge protection, this surge protector illuminates when in use to display power status. Included is monitoring of circuit to verify power and testing options that indicate open ground, open neutral and connect polarity as well as missing connectors. As I’ve mentioned, surge protectors are not quite as useful or as comprehensive as electronic monitoring systems (EMS). However, the Surge Guard model does have a circuit sensor built-in, meaning that you get more protection than you would with a standard unit. Since you don’t want to overload the circuitry of either your appliances or the outlet, having an indication of how much power you have is useful. While this model doesn’t split the difference and tell you how much is left, it’s a handy gauge for most RVers. Although surges are the most common electrical problem, they are far from the only threat to your electronics. Thankfully, this protector comes with sensors to tell you if the circuit is miswired, such as if it’s not grounded or if the polarity is wonky. This is a great surge protector that will supply your RV with the needed monitoring point that will prevent power surges from damaging your internal wiring. This surge protector is a bit more involved than most other units out there, and I appreciate the attention to detail. If you want more electrical security for your RV, this is an excellent choice. Just because this device tells you that the circuit is faulty doesn’t mean that it does anything about it. You will have to be savvy enough to realize that you have to unplug when a warning light goes off, since the protector won’t mitigate any high or low voltage for you. This surge protector features an easy-to-read lighted display that can quickly inform you of power problems. Testing features help protect your RV’s electrical system from faulty hook-ups. This surge protector is adaptor compatible. No reset button if the device trips during a surge. No protection for high or low voltage. The Camco Dogbone RV Circuit Analyzer is a small, highly portable device that supplies surge protection up to 200 joules. While small, it has built-in handles that make plugging and unplugging devices safer. Measuring just 30 x 6x 7 inches, the bright yellow, weather-resistant housing makes this surge protector highly visible, while diagnostic lights alert users to faults within the electrical system load before you connect your RV to your electrical box. Figuring out what’s wrong with an electrical outlet is easy when you’re using the Dogbone. These LED lights give you a quick indication of what’s happening so that you can unplug immediately and save all of your electronics. One issue with using such rugged surge protectors is that you have to pull hard to take them out of the socket. Fortunately, with this power-grip handle, you don’t have to worry about damaging the prongs or straining yourself too hard in the process. When comparing different RV surge protectors, one of the most crucial elements is how many joules it can withstand. As you can imagine, the higher the number, the better the protection. Although 4200 joules isn’t the most we’ve seen, it’s more than handy enough for your RV, whether you’re a weekend warrior or a full-timer. The design of this surge protector is nice. I like the feel of it in my hands and how well it can plug into the outlet. I also appreciate the LED lights warning me when something is wrong so that I can pull it out quickly to avoid catastrophe. Overall, surge protectors are great against surges, but not necessarily other electrical problems. While the Dogbone does warn against common issues like reversed polarity, it’s not as comprehensive as other models out there. NEMA 14-50 plug and receptacle. Water-resistant housing to help protect against weather damage. This item is not compatible with any adaptors. While in use, this surge protector may be audible or make rattling noises. There are no security features on this adaptor, and it is not small enough to allow power boxes to close completely, leaving a slight theft risk. LED light display for diagnostics. The Camco-Protector-Integrated-Protection-PowerGrip 50 AMP surge protector supplies 3,850 joules protection, high-low voltage surges and an automatic disconnect/reconnect feature when it detects voltage irregularities. The housing features color-coded LED lights to inform the user of faults. Measuring 27.8 x 6.5 x 6.4 and weighing a full five pounds, while portable, this surge protector is one of the largest portable models we’ve reviewed today. One issue that I have with surge protectors in general is that they are only good for one thing - surges. But, what happens if your electrical outlet isn’t producing enough power? That can be just as damaging, but you won’t know until it’s too late. With this model, however, you can rest easy, knowing that it will kick in whether you have high or low voltage. Best of all, it acts automatically, rather than warning you to unplug it (what if you’re asleep at the time?). Although we’ve seen higher joule ratings, this is still one of the better options out there. When you’re using up to 50 amps, you need as much protection as you can get. Not only does this model prevent improper voltage from damaging all of your electronics, but it will reset itself automatically as well. Thus, if your power is shut off, you don’t have to worry about coming back to a hot and stinky RV (with no A/C or refrigeration). Compared to most RV surge protectors, this model comes with some of the best features I’ve seen. I love that it protects against low voltage (hard to find), and that it kicks back on automatically. Overall, the only downside to this surge protector is that it’s not as comprehensive as some EMS units out there, and it doesn’t have as much joule protection either. Otherwise, it’s ideal for most RVers. Dog-bone handle for ease in attaching and reattaching. Automatic disconnect and reconnect feature when power surges or failures are noted. The heavy unit may be unwieldy to some. There are no locking features or handles. Joules protection is lower than comparable models. Why do I need an RV surge protector? While most RV campsites are regulated with electrical pads and boxes to provide continuous power, these sites aren’t the same as the sites that feed electricity to your home. Due to environmental factors, the actual voltage that is fed from these sources could vary greatly. Without a surge protector, what goes through your power source will go through your RV. RV electrical systems are complex and repeated-or even just one- power surge can cause permanent damage to your internal systems, which results in expensive repairs. Not only that, but individual appliances within your RV can be damaged beyond repair by power surges. Having a surge protector can eliminate this risk, and protect all parts of your RV investment. When you consider how often we experience thunderstorms or other inclement weather while RV camping, and how those conditions can affect the electrical feed to your campsite, investing in a surge protector becomes a no-brainer. It’s the easiest way to both protect your RV while helping to ensure you can enjoy uninterrupted power in all weather conditions. It’s important to note that surge protectors do more than protect your RV from electrical overload. In instances where the power being drawn is very low, a surge protector will also cut power. Your RV isn’t designed to run off limited power sources, and low voltage feeds can damage your electrical system just as much as a major surge. There’s always an element of trust when you plug your RV into a pedestal at your campsite. You have faith that the site’s electrical system is properly coded and up to date, safe and wired correctly. Unfortunately, as many campers have found out too late, this isn’t always the case. If you’re camping somewhere new it’s great to have a portable surge protector that includes LED diagnostics, like the ones we’ve listed here. As soon as you plug it in, the LED codes will inform you if the power source is appropriate and functioning. You’ll know instantly if it’s safe to connect the power source to your RV. Why would you choose a portable surge protector over a wired one? The answer to this is easy: convenience. While wired surge protectors do have attractive extras that might be hard to come by in portable protectors, they also have a flaw that eliminates all convenience. Once you rely on a wired-in surge protector, if anything at all goes wrong, if the protector stops working or is burnt out by a faulty electrical surge, you can’t take it out yourself. Replacement of these not only requires a trip to the dealer or auto shop, you can expect to pay a considerably higher fee for both the surge protector and the labor involved. It’s true that campers who spend a lot of time camping, or live aboard their RV’s, might find a better use out of wired surge protectors. They’re not easily stolen, provide protection from your RVs generator and are sheltered from the elements. For weekend campers or those that use their RVs for vacations, however, the complexities of maintaining a wired surge protector often make portable protectors a better choice. There are models available on the market that can be attached to your generator, and the ability to easily switch these out is attractive. Portable surge protectors are small and generally inexpensive enough that you can carry a backup with you if yours fails. Since they are easy to attach and require no electrician experience, you won’t have to cut your camping trip short should you experience any issues. If you’re on vacation or a weekend trip you’ve looked forward to, the last thing you want to do is leave early due to a failure issue in your wired surge protector. Do I Need 30 AMP or 50 AMP Service? How do you know what AMP you need for your RV? Typically, surge protectors come in both 30 and 50 AMP. The real issue here is camp pedestals are pre-set to be either 30 or 50 AMP. When you pull in to your campsite, you have to connect your RV to the pedestal, with whatever AMP it has running through it. The long and the short of it, is your RV is also wired to be either 30 or 50 AMP. In a perfect world, your RV capacities and your campsite electrical feed would always match, but that’s not the case. Often campers experience a situation where AMP hookups between their RV capacities and the campsite pad’s feed don’t match. The best thing to do in this situation is two sided. If your RV is wired for 30 amp, you should invest in an adaptor that has a 120 volt male and female end. This adaptor will fit onto your RV and allow you to safely connect to a 50 AMP campsite with a portable surge protector. You won’t have to be concerned over potentially overloading your system, and you won’t be limited to only camping on sites that match your RVs AMP. What if the situation is reversed, and your RV is wired for 50 AMP, but the campsite is delivering 30? There is also an adaptor for this. You’ll need a 50 AMP female to 30 AMP male electrical adaptor, commonly called a ‘dog bone’. This will transfer the electricity in a safe way to your RV. In many of the reviews above, you may have noticed that these surge protectors were rated as either adaptable or not. This should play a big part in your purchase decision. While you may have an adaptor that will allow your RV to access energy from any camp pad, if your surge protector isn’t adaptable, you might not be able to use it. As we discussed earlier, surge protectors are vital to maintaining the integrity of your RVs electrical system. This is even more important when you’re adapting your system to connect to an AMP different from the one it’s originally wired for. While adaptors are great, they can potentially increase the instances of electrical surges. If you utilize an adaptor during your camping, you should always use a surge protector. What gear do you plan to plug into the RV surge protector? It’s equally as important to consider the gear that you are planning to connect to your RV surge protector. While wired surge protectors are often connected to your back-up generator, portable surge connectors only protect the area from your pad and electrical feed to your RV. Therefore, in the instance of a power outage, requiring the use of your RVs backup generator, this power will then be delivered without the buffer of a surge protector. Obviously, this is undesirable for the same reasons drawing power from a camp pad without a surge protector is ill-advised. To fully protect your RV, you should have a surge protector on both your generator and your connections to your campsite. It’s also advisable to do a complete inventory of all your appliances that use power within your RV. This is a consideration when reviewing portable surge protectors, as each one is rated for joules. Joules is an electrical term for energy and is equivalent to one 3600th of a watt. One joule per second is equal to one watt. The power surge protectors listed above each have a joules protection rating, from 3,800 to over 4,000. Knowing your appliance wattage usage is important when selecting a power surge protector due to the ability for a power surge to destroy appliances. While running appliances in your RV that require less than the listed joules/wattage energy might avoid damage, if you experience a power surge over the jules/wattage usage, any appliance that is rated for less than that wattage may sustain substantial damage. For this reason, it’s best practice to select a power surge protector that carries a higher range of joules protection. We hope this has answered all of your questions regarding RV power surge protection. It’s a great idea to invest in them, but when you get right down to picking one, it’s not always an easy choice. We understand electrical considerations for your RV can become complicated quickly. The primary focus is to protect your RV while enabling constant power to fuel your vacation without interruption. For the purpose of this review, no comparably priced portable surge protector came close to matching the features included in the Progressive-Industries-EMS-PT30C-Portable-Protector . While it is a little larger than other review models, it makes up for it with the tough housing and included cord. For a second-runner up model, we’d go with the Technology Research Surge Guard 44270 . While slightly smaller than the Progressive Industries PT30C model above, it also lacks some features that such as the durable housing and included accessories. Now that you know more about surge protectors, let’s look into why you need one for your RV and why you would choose a portable over a wired-in model.